Diese Kabel gibt es praktisch für alle anderen Kopfhörer, sollte Ihr Kopfhörer nicht in der Auswahl sein melden Sie sich bei uns, gerne offerieren wir Ihnen ein passendes Kabel. The cable is extremely smooth sounding with great low end and wonderful voicing. It will also remove the veil from all headphones just like the Silver Dragon. Most stock headphone cables are made of poor ultra thin conductors that work as a bottle neck for the sound. Poor Geometries, no shieding, rubber jackets and a whole host of other issues by OEM (stock) cables can limit what the headphone driver can produce in terms of clarity and definition. The Black Dragon offers a great well rounded sound that suits most genres of music. It is a little warmer than the Blue Dragon with fuller sound and more bottom end weight. Both the Blue and Black Dragon are not a laid back lush sound, they are closer to neutral, natural sounding cables. 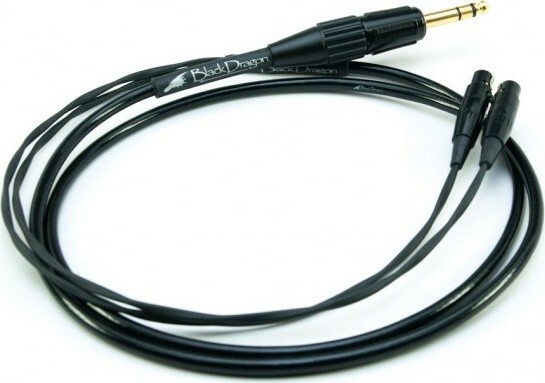 The Black Dragon is very smooth and musical and that is the best way to describe this cable. It is perfect for a headphone that can tend to sound a bit edgy or bright and its a great addition to improve the bass frequencies on a "bass light" headphone. The Black Dragon can by used not only as a detachable cable for many varieties of headphones, but it can also be used to hack your headphones. We can "hard-wired" to just about any headphone such as Grado, Sennheiser or AKG. 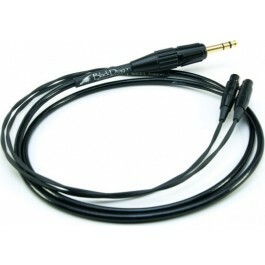 You can also upgrade your exisiting headphones that have detachable cables with our Black Dragon. There are many connections to a variety of headphones to choose from on the menu above. We recently added some specialized "Black Dragon headphone cables" for certain headphone models and brands: the Black Dragon Premium HD800 Headphone Cable, Black Dragon HD700 Headphone Cable, & the Black Dragon Shure Headphone Cable. We use 4 x 21.5AWG Teflon insulated stranded conductors using pure single crystallized UP-OCC pure copper with 7N purity 99.99998%. This means more music, clarity and sound quality gets to your ears as purity in cable construction, cable design and quality of materials make a noticeable difference in the sound quality of your headphones. Each conductor is made up of a special varying size stranding geometry. The copper stranding is mixed with Kevlar stranding to reinforce the conductor. Making it stronger overall and less prone to failure due to the harsh constant flexing a headphone cable receives. The conductors are then surrounded by cotton and then a layer of Teflon tubing. The new v2 version is now also double shielded and placed in a polyethylene jacket for further protection. The Headphone connectors are soldered directly to the conductors of the cable. The splicing method used by other cable companies using a stock cable's connectors is a poor method. We have developed many of the hard to find connection options utilizing plastic injection molded connectors. Great expense has been taken to bring as many hard to find connection systems for the most populat headphones. If you cant find the connection system you desire please contact us. Wir führen das komplette Kabelsortiment von Moon-Audio. Benötigen Sie ein solches Kabel für einen anderen Kopfhörer oder mit einem anderen Anschluss setzten Sie sich mit uns in Verbindung. Gerne offerieren wir Ihnen ein passendes Kabel.